Description	 MS in Neo Babylonian on bronze, Assyria, 811-783 BC, lower part of the garment of a giant statue, 42x26x5-10 cm remaining, single column, 19 lines in a large formal cuneiform script, the lower border of the garment, 6x18 cm, divided into 4 square compartments with decorative designs of Assyrian type. Commentary	 A unique royal inscription. There seems to be no other remains of so large a statue of an Assyrian king surviving. 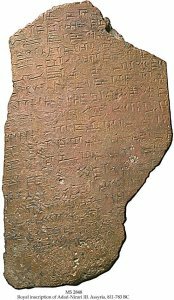 Assur-nasir-apli II was the son of Tukulti-Ninurta II and the great grandfather of Adad-nirari III. Published	 Andrew George, ed. : Cuneiform Royal Inscriptions and Related Texts in the Schøyen Collection, Cornell University Studies in Assyriology and Sumerology, vol. 17, Manuscripts in the Schøyen Collection, Cuneiform texts VI. CDL Press, Bethesda, MD, 2011, text 75, pp. 149-152, pls. LV-LVII.